The boy has cerebral palsy. He cannot sit, walk and speak. Six-year-old Anton Orlovich has cerebral palsy. He doesn’t go to school, cannot sit and speak. Anton’s medical history began five years ago on Christmas Eve. All of a sudden the boy had cramps. Anton was diagnosed with cerebral palsy. “We have immediately realized that our life has radically and irrevocably changed. But our son is a part of us, and we are ready to fight for his life”. The parents didn’t ask themselves never ending questions trying to find the causes of the troubles, they just did everything possible to help Anton. 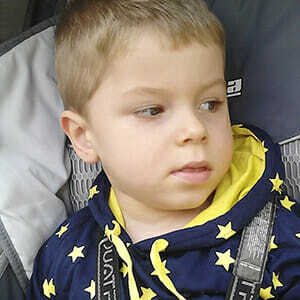 The boy underwent treatment in the Belarusian centers “Mother and Child” and “Tonus”, in the clinic “Adele” in Slovakia. “But soon we’ve understood – you can’t jump over your own head. We have to stop living in the world of useless dreams of full recovery, and accept the reality: our son needs us now, and we must do everything possible to make his life better”, – says Natalya, Anton’s mother. For a better life Anton needs a wheelchair, that costs 2 860 USD.